Haq's Musings: Did Pakistan Pilots Carry Out UAE AF Air Strikes in Libya? Did Pakistan Pilots Carry Out UAE AF Air Strikes in Libya? 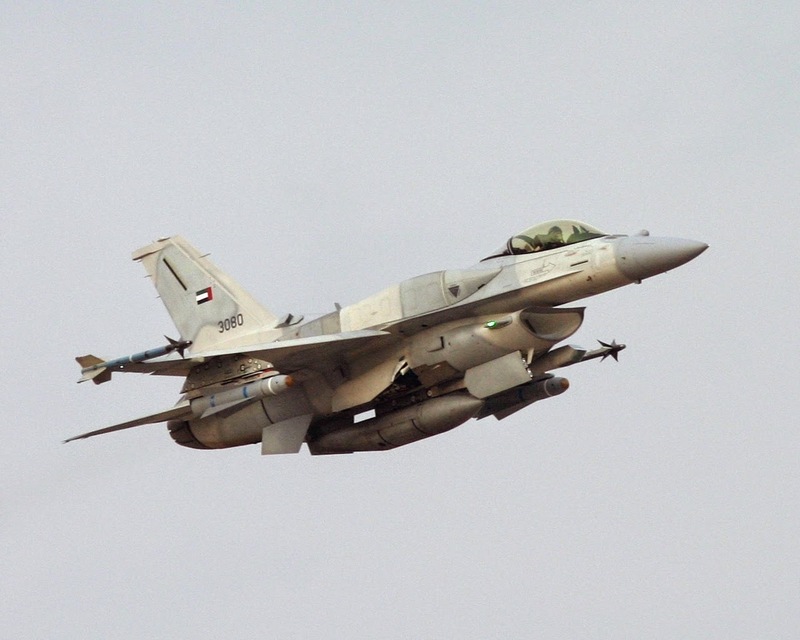 UAE fighter jets flying from bases in Egypt carried out airstrikes in Libya a week ago, according to US media reports. Question: Did Pakistani pilots working for UAE participate in these missions? Targets were hit in the Libyan capital of Tripoli secretly without without informing the Obama administration beforehand. The first wave of airstrikes hit positions in Tripoli controlled by insurgent militias, including a small weapons depot. The second wave targeted rocket launchers and military vehicles owned by militias, the New York Times reports. It is widely known that the vast majority of pilots working for the UAE Air Force are Pakistanis. The involvement of Pakistan Air Force in UAE began in 1970s with a training mission in the Gulf nation. Some of the serving PAF officers are on deputation, but most are on civilian contracts with the Air Force Headquarters in Abu Dhabi. Officers of other nationalities have also trained UAE pilots, among them Moroccans, Canadians, Jordanians, and South Africans. After 1998 US-sanctions on Pakistan following its nuclear tests, the United States objected to plans by the United Arab Emirates air force to contract up to 200 Pakistan air force fighter pilots to fly F-16D Block 60 fighters it had ordered from Lockheed Martin. The deal was significantly delayed as UAE threatened to re-open the fighter competition to choose alternate suppliers. It was eventually resolved and the US agreed to deliver the purchased F-16s to UAE. 1. Were these PAF's serving pilots on deputation with UAE Air Force? Or retired officers on contract? If they were on deputation, did they seek permission from Pakistani government to accept these missions? 2. Will such missions drag Pakistan into ongoing Middle East conflicts and hurt Pakistan's interests in the region? 3. Will those targeted seek revenge against Pakistanis? Faisal: "Even though most Instructors in the UAE Air Force Academy are ex PAF, there are very Pakistani pilots in UAE. They will not fly operational missions without the green signal of the AHQ"
But these could be retired PAF pilots serving under contract. Why are you so interested in making public/releasing this information? According to many in UAE it was Pakistani pilots on deputation. Army dictates the foreign policy of Pakistan and we are on the moderate side of Islam supported by Saudi but against radical Qatar. The Israel Air Force is set to take part in a large-scale aerial exercise in the United States later this month. According to reports, teams from the Pakistani and United Arab Emirates air forces will also be taking part in the Red Flag air-to-air combat exercise in Nevada. Israel will be sending land and air crews, as well as F-16 fighter jets, to the exercise, which is one of the biggest in the world. Haaretz asked the IDF spokesman to comment on the Israeli military’s policy on training with teams from Pakistan and the U.A.E. – countries Israel has no diplomatic relations with – but received no response. The IAF has been preparing for the exercise over recent months, including the long-distance flight from Israel to the Nellis Air Force Base in southern Nevada. Flying the F-16s to the United States will require several fueling stops along the way, as well as midair refueling. The IAF also participated in last year’s exercise, which simulates aerial combat fighting. The participating teams are put in a “blue” team and a “red” team, and these hold dogfights with one another. Teams from the United States, Israel, Singapore and Jordan took part in last year’s exercise. At the time, it was reported in foreign media outlets that Israeli aircraft even refueled Jordanian jets en route to the United States for the exercise. The teams that took part in the exercise practiced intercepting aircraft, attacking targets, rescuing pilots and flying under the threat of anti-aircraft missiles. The Nellis Air Force Base website didn’t disclose which air forces will be participating in the upcoming exercise. However, aerial enthusiast websites reported that teams from Spain and the U.A.E. will be taking part. Spain’s Ministry of Defense reported that the Spanish Air Force sent teams to the exercise last weekend. Pakistani media outlets also reported that Pakistani F-16s were en route to the United States. The Aviationist, a website devoted to reports on military aviation, stated that Pakistani F-16s landed in Portugal 10 days ago, on their way to the exercise. The Turkish Armed Forces (TSK) has been trying to increase the number of its jet pilots after the Air Forces were hit by dismissals carried out after the failed July 15, 2016 coup attempt, widely believed to have been masterminded by the Fethullahist Terrorist Organization (FETÖ). After the thwarted coup, it was revealed that a significant number of followers of the U.S.-based Islamic preacher Fehullah Gülen were in the Air Forces Command and 1,752 personnel were dismissed with state of emergency decrees. The F-16 jets of American firm Lockheed Martin constitute a majority of Turkey’s warplane fleet with 240 jets. The government, which has been focused on measures that would increase the number of jet pilots, is searching for F-16 trainers abroad. Pakistan was the only country to accept Turkey’s request. However, the U.S. objected to Pakistan sending F-16 jet pilot trainers to Turkey, based on the agreement that U.S.-origin equipment’s purchase, sale, maintenance and training between third countries needed approval from Washington. “If you send your F-16 pilots to the U.S., we can train them here,” the U.S. response read, while Ankara insisted on pilots receiving treatment in the bases in Turkey and in their own geographical conditions.